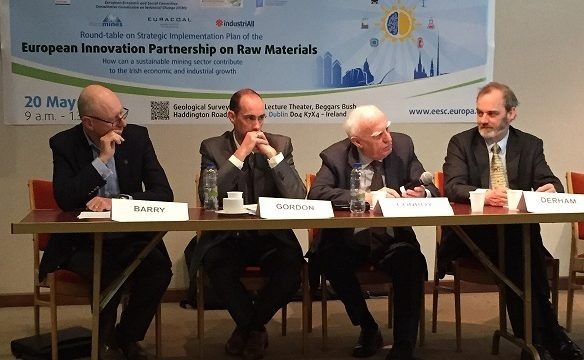 A Round Table on the Implementation of European Innovation Partnership on Raw Materials was held at the Geological Survey of Ireland (GSI) on 20th May. The event was organised by the European Economic and Social Committee’s Commission on Industrial Change (CCMI) in partnership with the European Commission, Euromines, the Exploration & Mining Division and the GSI. What needs to be done from a European and Irish policy perspective to enhance social licence to operate in Europe and Ireland . EESC Round Table; form left John Barry, Paul Gordon, Prof Richard Conroy and Dr Jonathan Derham. Speakers included Dr Eibhlin Doyle of EMD; Dr Jonatahn Derham of the EPA; Slavako Solar of the EU DG for Industry; Brendan Morris of the Irish Mining & Quarrying Society; Prof Richard Conroy of Conroy Gold and John Barry of Group 11 Resources. Sean Finlay of Geoscience Ireland (GI) presented on the export of Irish skills and services to the international extractive industries. Paul Gordon of SLR Consulting (also a GI member) presented results of a recent GSI commissioned study into Attitudes to Geoscience. See link for more. The Round Table in Dublin follows a series of similar events in Spain, Slovakia, Romania, Finland and Portugal. The Innovation Partnership on Raw Materials is a key EU policy designed to contribute to maintaining the competitiveness and sustainability of European industry.